For some people, it’s Taylor Swift. For the older crowd, it’s ABBA. Or maybe it’s Dumb and Dumber. And what do you think of Baltimora, with the unforgettable hit “Tarzan Boy”. What am I talking about? The guilty pleasure of course. An artist, movie or book that is perhaps not very hip and happening, but you think it is cool and so enjoyable. This is also possible with slots. Gems of Gods is my guilty pleasure. This slot does not have insane graphics, brilliant animations, nor does it possess a killer soundtrack. But time and time again I find myself playing this slot and I realise that I lose track of time and that an hour has gone by before I know it. How does the Gems of Gods slot work? The setting is Mount Olympus in Greece where the gods reside and make sure that everything is running smoothly in the human realm. The playing field consists of a matrix of 5 x 5 symbols. There are no fixed paylines, and you pay a set amount per spin. The betting range goes from the minimum $€ 0.20 right up to the maximum of $€ 100, per spin. This way both the small recreational player and the high roller can enjoy this slot. The symbols consist of a mix of gemstones. Besides that, there are gold coins to be found on reels 1, 3, and 5. These gold coins activate the free spin bonus, but only after they found their way to the bottom position on the reel. Winning combinations are made by getting a minimum 3 of the same symbols in a row, and that can happen horizontal or vertical. Winning combinations disappear allowing the symbols above to tumble down and make new combinations. There is also a multiplier that goes up to a maximum of 8 x. Sometimes 1 lightning bolt appears on the screen, and very rarely there are 2. These make 1 symbol change into another, increasing the odds for big combinations. When 1 or more coins have worked their way down you win the free spin bonus. You start with five free spins, where every golden coin that activated the bonus becomes a sticky wild for the remainder of the free spins. These free spins can be retriggered endlessly, something that occurs quite frequently. 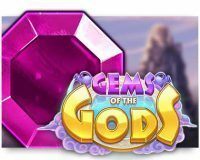 Our verdict on the Gems of Gods video slot? 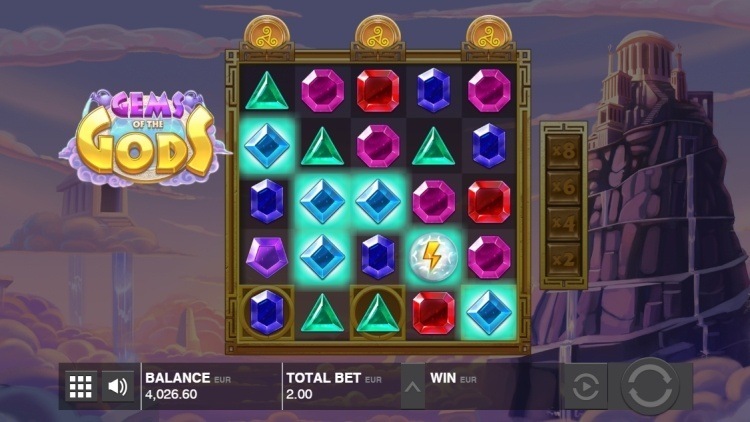 Gems of Gods is a simple, but entertaining slot by Push Gaming. The variance is on the low side, but sometimes you can score some great payouts, especially when you hit 5-of-a-kind. The free spin bonus thankfully drops often and is also good for a nice reward most of the time. 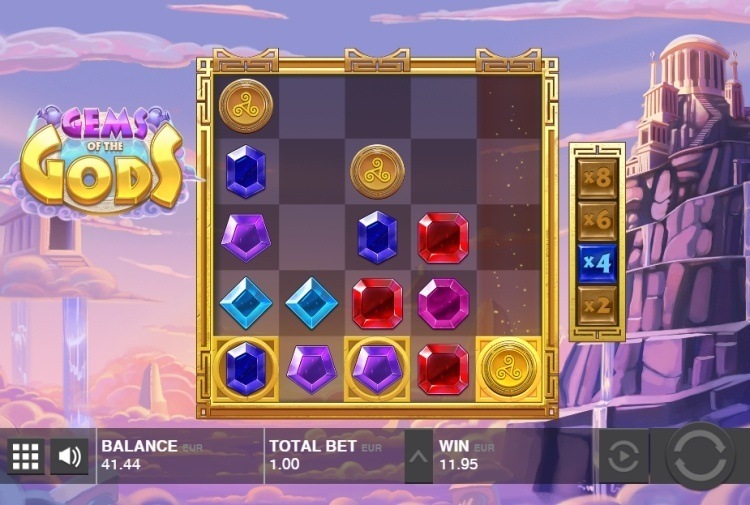 Gems of Gods is very playable on your mobile device and is ideal to while away 15 minutes here or there. Or an hour for that matter. Where can you find Gems of Gods? The Gems of Gods slot is found at all reliable Push Gaming casinos. One of these Push Gaming casinos is Casumo, which is one of our favourite online casinos. 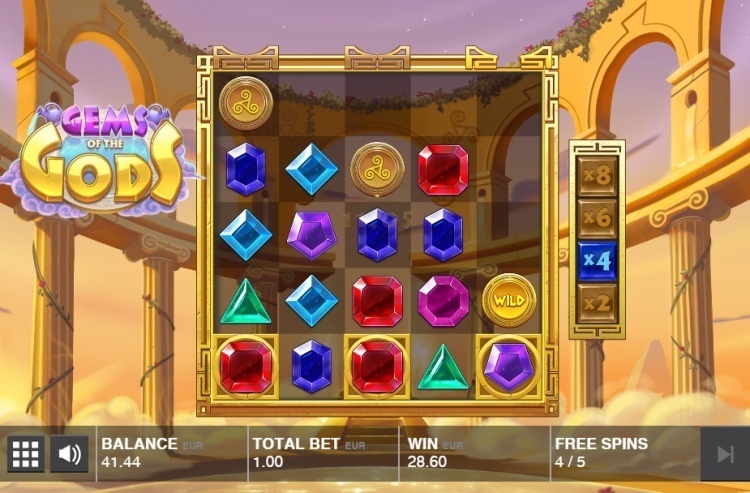 You can play the Gems of Gods slot at Casumo with a 200% bonus up to $€50 plus 200 free spins.